We hand-planted the orchard in January 2009, using the ‘notch’ method (to minimise disturbance to the existing soil structure). We spent a year collecting waste cardboard, much of it donated by the village shop. We layered this mulch around the base of our young trees. Every trace of this cardboard had disappeared by the end of the first season, but the grass was held back long enough for the apple tree roots to begin to establish themselves. Click here for photos of our orchard in the early years. Forget about the serried lines of closely packed fruit bushes found in big commercial orchards – arranged solely for the convenience of big machines. 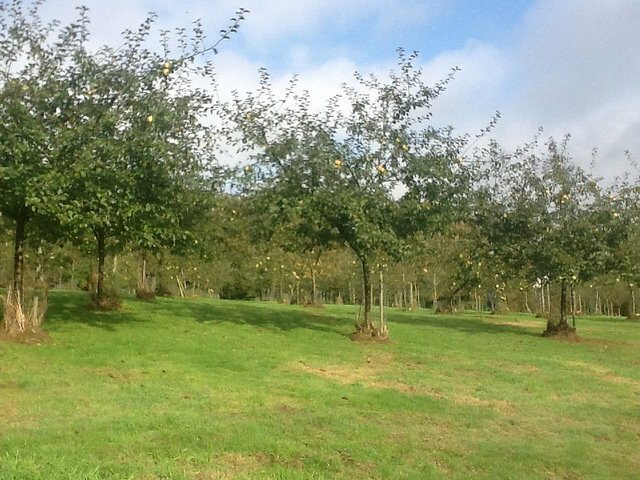 We wanted to help restore a local landscape feature: the ‘traditional’ orchard of the type that made the West Country so distinct over the last few centuries. A traditional orchard is a group of large, long-lived fruit trees planted at low densities in permanent grassland, and managed in a low intensity way (no sprays). So highly valued are these man-made environments, they are now considered a ‘priority habitat’ by the government: hotspots of biodiversity in the countryside. 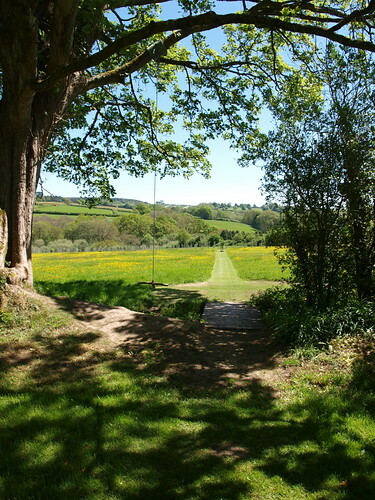 So we’re trying to do our bit by planting big ‘standard’ or ‘half-standard’ trees at 6 or 9 metre intervals which, when fully grown, will range in height from about 4 metres to about 7 metres. 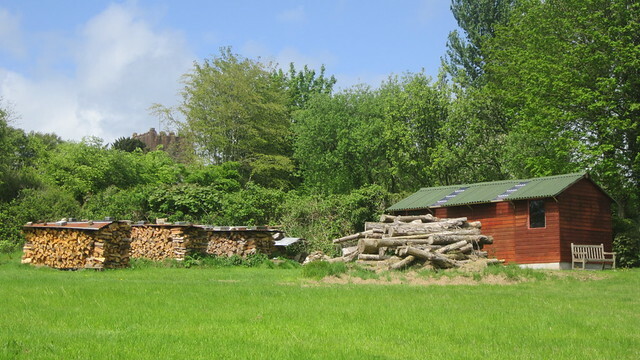 We actively manage our orchard for the benefit of wildlife and the environment, and the range of species resident or visiting our small orchard is stunning. Our Wildlife page lists some of the birds and beasties that we have spotted so far. Click here for photos of our young orchard through the seasons, from planting to the first proper apple harvests. We prefer a sharper more complex tasting juice to the usual sickly sweet concoctions available in the supermarket, and there is no doubt that the best flavours are the result of blends. So we planted a range of interesting and unusual apple varieties – from sweet and aromatic dessert fruits, to sharp and tangy cider and cooking types (click here for more on our trees’ provenance). Each bottle of juice (and vinegar) contains a wide selection of these different apple types: producing the rich and rounded flavour. However, no one batch is ever quite the same, with particular varieties ripening at different times, and in varying yields, from one year to the next. All the apples for our juice and vinegar comes from our one orchard. We don’t buy-in apples from anywhere else. We don’t use any sprays or chemicals, and we hand-pick all the fruit. In fact, the apples are usually picked, pressed and bottled on the same day – in our little processing shed at the top of the orchard. For juice and vinegar sold in the village (or guzzled by us), zero food miles accrue. Most of the rest of our juice travels only as far as it needs to – to cafés, shops, pubs and other outlets in the surrounding villages and towns of North Devon. To read more about how we make our apple juice, click here.